DNA is a nucleic acid. Nucleic acids are biological macromolecules containing oxygen, hydrogen, carbon, nitrogen and phosphorus. There are two types of nucleic acids: ribonucleic acid (RNA) and deoxyribonucleic acid (DNA). Nucleic acids are made up of basic units called nucleotides, which bind together with covalent bonds to form a polynucleotide or the nucleic acid. A nucleotide is made up of three parts: a five-carbon sugar (deoxyribose in the case of nucleotides in DNA), a phosphate group connected with a covalent bond to the sugar’s fifth carbon atom, and one of four possible nitrogen-containing bases connected with a covalent bond to the sugar’s first carbon atom. The nitrogen base may be one of the single-ring pyrimidine derivatives thymine (T) or cytosine (C), or one of the double ring purine derivatives adenine (A) or guanine (G). 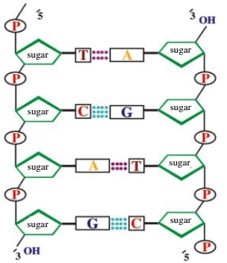 When the nucleotides are linked together in a strand of DNA, the phosphate group attached to the 5′ (pronounced ‘five prime’) carbon of the deoxyribose sugar of one nucleotide becomes joined to the 3′ carbon on the sugar of an adjacent nucleotide. The strand in which the sugar alternates with phosphate is called a sugar-phosphate backbone. The backbone is not symmetrical. It has a definite orientation, with a free 3` hydroxyl group at one end and a free 5` phosphate group at the other end. The purine and pyrimidine bases stick out to one side of the sugar-phosphate backbone. In each DNA molecule, the number of nucleotides containing adenine (A) equals the number containing thymine (T), and the number containing guanine (G) equals the number containing cytosine (C). SO A = T and G = C.
Evidence of the DNA structure comes from studies made by Franklin, who used X-ray diffraction technology to get pictures of highly purified DNA crystals. In this technology, X-rays pass through the crystals of molecules that have a regular structure, the result being a scattering of X-rays. This produces a pattern of dots which, when analyzed, give information about the shape of the molecule. In 1952, Franklin produced such photographs for crystals of highly purified DNA. Her results showed that DNA is twisted into a spiral or helix, with the bases perpendicular to the length of the fiber. These pictures also provided evidence that the sugar-phosphate backbone is on the outside of the helix, with the bases on the inside. Furthermore, the diameter of the helix showed that it must be composed of more than one strand of DNA. After Franklin made her pictures, a race started between scientists to put all of the available data together into a consistent model of DNA structure. Two British scientists, Watson and Crick, were the first to put together an acceptable model. The model of DNA structure created by Watson and Crick consists of two strands of DNA. The two strands are arranged like a ladder, with the ladder’s sides being the sugar-phosphate backbones of the two strands and the rungs being the bases. A rung may consist of either an adenine paired to a thymine, or a guanine paired to a cytosine. In each rung, either base may be on either strand. The pair of bases in each rung is held together by hydrogen bonds. Two hydrogen bonds hold an adenine-thymine pair together, while a guanine-cytosine pair is held together by three hydrogen bonds. Because each pair consists of one single and one double ring, all the rungs of the ladder are the same width, and the backbones of the two DNA strands are always the same distance from one another along the length of DNA molecule. Watson and Crick also saw that, for hydrogen bonds to form properly between the base pairs in DNA, the two nucleotide strands of the DNA molecule had to run in opposite directions, with the free 5`phosphate groups of the two strands at opposite ends of the molecule. The whole ladder of DNA is twisted, with ten nucleotide pairs per turn, to form the spiral detected by Franklin’s X-ray photographs. Because the spiral is composed of two strands wound around each other, the DNA molecule is referred to as a double helix.